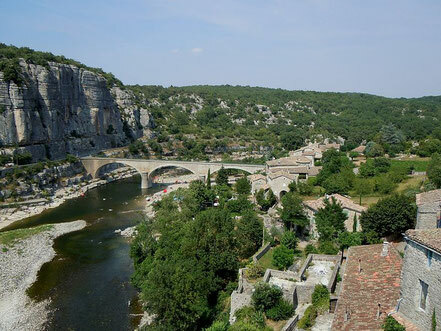 The Middle Age Village is located at the junction of three rivers (Ardeche, Beaume and Chassezac). 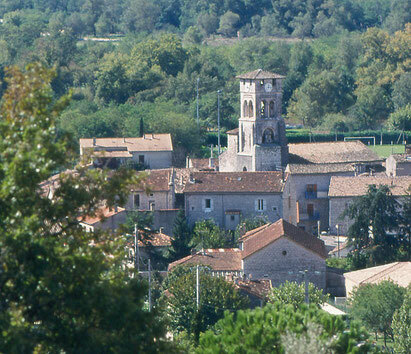 The city started its development in the X century with a priory built by the priests of Cluny’s abbey. You can still admire the chapel Notre dame des Pommiers and its paddock. The old village has been strenghtened by the walls and their six towers. You can also visit the church of the 11 and 12th century. This church belong to the National Monuments. Today, more than 2000 people are living in RUOMS . Its economical resources are based on tourism and a dynamic wine culture. You can be explained the wine culture at the interactiv museum of vineyards and Ardeche’s wines of Neovinum. You can find at the tourist agency all the necessary information on the all the region activities inside and around Ruoms. Among all those activities, you will enjoy a family game course across Ruom’s historical city center. Men have been living in the Vallon Pont d’Arc for at least 50 000 years. You can find proofs of human lives among many remains and particularly in many caves. 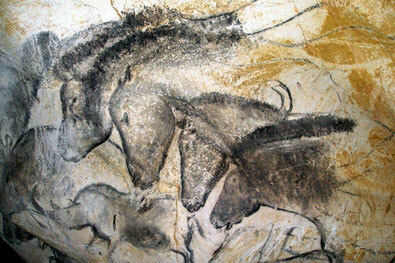 After visiting the city, go to the Chauvet Pont-d’Arc cave, where you find more than 35 000 year old paintings. The roman style Saint Madeleine Church : The Roche Haute Association is organizing many concerts and painting exhibitions every summer. The Viel Audon picturesque hamlet : you reach that place after a 15 minute walk on a path along the Ardeche river. For 35 years young people have been coming to restore the ruins and repair the hamlet. Inhabitants abandonned the place one century ago. 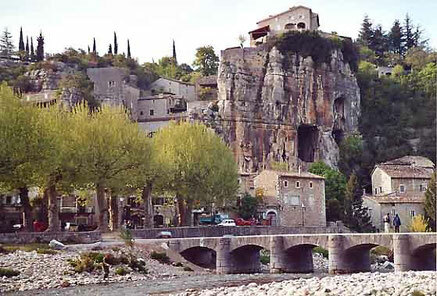 Along the La Beaume river, the village is surrounded by cliffs once full of troglodyte caves. Its stone-made homes are standing close along tiny and sinuous calades. These tiny passages create a real labyrinth. The Hanged Gardens of Le recatadou in Labeaume are located above the Beaume river cliffs. 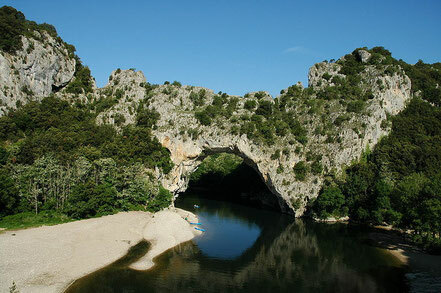 The Ardeche department is famous to be the secound French region for its number of dolmens. 142 dolmens are located on the area. The Labeaume Music festival takes place every year every thurday and Friday evenings from mid July to mid August. It’s the highest point of Ruom’s area. 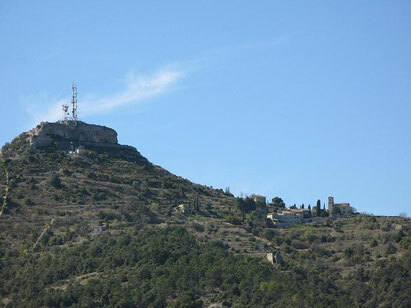 You can enjoy a perfect sightseeing view of the overall Vivaraix up to the Cevennes, The Ardeche’s mountain and Mount Lozere. If you are brave enough, you can climb up to there. Otherwise you can drive and park your car. The cave will surprise you by its size and the beautiful underground landscape : it’s a fairy world of chalk stones and crystallizations. Located 121m under the ground, the sound and the light are sublimating the place. And then you can use the lift to go back on the ground without any efforts. You can find the wonders of a thousand year old natural and cultural past, located between the Ardeche cliffs and the Valley de la Ceze. 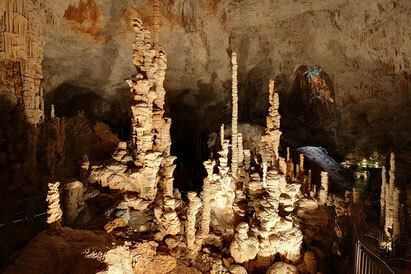 Surrounded by a typical deep evergreen oaks forest, you discover the cave mysteries whereeas the first European left upstairs many proofs of their lives. Outside, The Museum keeps turning into the City of prehistory in February 2014. The new visit tour will propose you to discover a sensible and funny history of mankind since the Paleolithic up the First Iron Period (-350.000 to -500 years BC). Firt room of Aven d'Orgnac cave, Ardeche, France. For those who like practicing sports, you can bokk a cave hunting. The underground run (3 hours) and the Odyssey (8 hours) give you access to the wild underground network. On the contrary, The Vertige (3 hours) allows you to discover the cave ceilings. Antraigues is located on a high basaltic piton above the valleys of Volane, Bise and du Mas. In the chesnut trees country, high of 470m, the air is fresh and pure and nature is wild. Lanes, flowered pavement calades, covered passages are built along this old cevenol village. Old markets, concerts and games of bowls provide fun and animation.